The significance of this image of 'Ch. Royal Hector' is that it gives us a rare, and probably one of the earliest insights, into the foundation cats that were basis on which the Blue Persian variety was built. 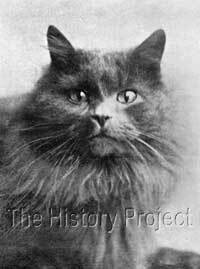 Although 'Hector' was shown successfully, he himself was retained as a Neuter, and was therefore not a contributor to the establishment of the Blue Persian. He was however, a full sibling to 'Ch. Glaucus', for whom we have no image, but who had a significant and lasting contribution to make in establishing the Blue Persian as a leading colour variety of the Longhaired cat. 'Ch. Glaucus' was one of the early second tier 'Pillars' of the Persian breed, alongside cats such as 'Ch. Bundle', and descended from the first tier males, the likes which were 'Ch. Turco', 'Ch. Perso' and 'Thunder and Lightning'. 'Royal Hector' was bred by Miss Rosa Bray, one of the earliest stalwarts of the Blue Persian variety, in a repeat of the breeding that produced 'Ch. Glaucus' in February 1890. He was born 26th, April 1890, sired by Miss Bray's 'The Friar' (1888), a Blue son of 'Ch.Turco' ex 'Zeika'. His dam was Miss Bray's 'Zeta' (1888), the Blue daughter of 'Ch.Perso' ex 'Moos'. As a de-sexed cat, he became the property of Miss Kate Sangster, famous as the owner of the renowned Tortie Longhair, 'Royal Yum Yum'. 'Hector' could also be labelled as the cat with three names, as he was originally registered, in Volume Two of the Studbook of the National Cat Club as 'Ch. Southsea Hector' in 1894, under the registration number 1187.2 He was then re-registered in Volume Three of the Studbook of the National Cat Club as 'Ch. Royal Southsea Hector' in 1895, under the same registration number.3 Then lastly, in Volume Five of the Studbook of the National Cat Club as 'Ch. Royal Hector' , with a revised registration number of 3187.4 In all three cases, his sire, dam, date of birth and ownership are identical. The most significant blood relationship to 'Royal Hector' is that of his full slightly older sibling, the renown Blue, 'Ch. Glaucus', who was born 21st February, 1890. Through this brother, he can claim to be an uncle to all his brothers well-known offspring, which include, among others, such cats as 'Moko' (the sire of Pooh-Bah and Mabel of Lozells), the equally famous 'Beadle' (aka Bumblebee) who was an export to Mrs. Adele Locke in the United States, full sisters 'Ch. Diana' (1892) and 'Glaucus Nita', the dam of 'Daisy Nita of Thorpe', who in her turn as the dam of 'Ch. Orange Blossom of Thorpe', was the key progenitrix to one of the largest Blue Persian dynasties ever created. Two relatives of 'Royal Hector' via his full brother, 'Ch.Glaucus'. Miss Bray repeated the same breeding of 'The Friar' to 'Zeta' a number of times and from these breedings came to females, which were also full siblings to 'Ch. Royal Hector'. 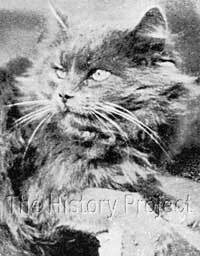 One was 'Carrie', a Blue Persian female born 27th September, 1893 and subsequently sold to Mrs Bluhm. The following year, Miss Bray retained 'Nonna' a Blue Persian female born 21st May, 1894. 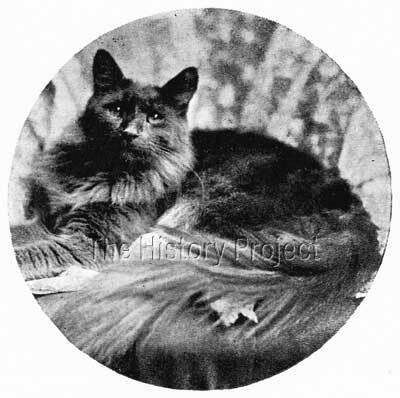 By natural extension, another closely related cat was 'Lindfield Bootles' the Blue Persian born in August 1890, and shown by Miss Frances Simpson as a kitten that year. 'Bootles' as he was simply known by then, was by 'The Friar' but also related through his dam, 'Lily' who just happened to be an earlier daughter of 'Zeta', so that by pedigree at least, 'Bootles' was a three-quarter sibling to 'Ch. Royal Hector'. 1st, Cup and NCC Medal, Portsmouth, 1890; 3rd, Crystal Palace, 1891; 3rd, Brighton, 1891; 1st and Special, Chichester, 1891; 2nd, Portsmouth, 1891; 2nd, Crystal Palace, 3rd, Brighton, 2nd, Chichester, 2nd Portsmouth, 1892; 1st, Silver Medal and Special, Crystal Palace, 1893; 1st, Brighton, 1893; 1st and Special, Portsmouth, 1893; 3rd, Chichester, 1893; Champion Silver Medal, Clifton, 1894; 2nd, Bath, 1894; 2nd Portsmouth, 1894; 1st and two 2nds, Holland Park, 1896; 3rd, Botanic, 1898. 'Ch. Royal Hector', full brother to 'Ch. Glaucus' (by 'The Friar' ex 'Zeta).